Happy Summer all! As you’ve probably surmised by now, Nick and I are both pretty big foodies. We love exploring new restaurants, and have somewhat of a tradition of seeking out fun, unique restaurants for each other’s birthdays. Not too long ago it was Nick’s birthday, so I surprised him with dinner at Townsman! 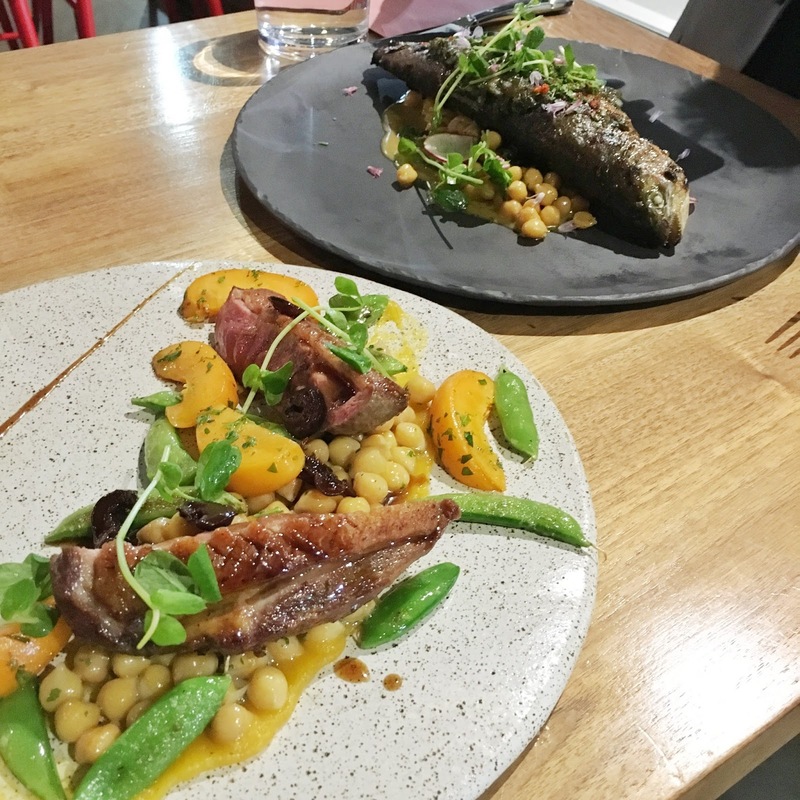 Since Townsman was recently named one of ten restaurants of the year by Food and Wine Magazine, we were excited to see what all the hype was all about! Matt Jennings’ Townsman is situated in Downtown Boston near Chinatown and the Greenway. It has outdoor patio seating (yes! mental note made to come back when it’s more warm out), red accent seating, fun planetary light fixtures, and a drool-worthy menu which focuses on sustainability and local sourcing. Loved the trendy ambiance! This is definitely a local spot, with a mix of suits from nearby offices grabbing a good meal after work, along with casual diners like us. Digging the back of the menu design. Townsman’s trendy, modern take on complimentary bread and butter. I was obsessed with this – how cute is that tin can? I mentioned that I was gluten free and they actually managed to bring out delicious, life-giving cornbread to accommodate! Most waiters and restaurants start sputtering when I bring this up, and I don’t blame them – it’s tough to work around no gluten, which means no wheat or flour! So I get it. But at the same time, if anyone should be prepared for this, it should be modern restaurants, right? I was super impressed by their service and dedication to taking care of the customer’s needs before we even asked. We started with the lightest and brightest deviled eggs ever! These were different than any deviled eggs than we’ve tried before – usually it’s just the hard boiled egg white cut in half and filled with the yolk/mayo/mustard/etc. At Townsman, the eggs were coated in the mixture, in addition to fried capers, clay pepper and crispy hen skin. The plate proved to be very refreshing and comforting, and at the end of the meal we were still raving about it! Next we noshed on the Octopus a la Plancha, with plantains, mole, and citrus. I’d only ever enjoyed octopus with sushi in the past, and having a huge tentacle was an entirely new experience! It was rubbery and dense but not too tough, and the light citrus flavor offered a great contrast to the smokey octopus and it’s texture. We were honored to try a dish not even on the menu! This arctic char skin and smoked cream cheese was another plate that was so different than anything I’ve tried before. The char skin was salty and crispy, and reminded me of a fun seaweed snack. We broke it up like chips to scoop the sour cream. This is the perfect example of why dining at Townsman is so fun – you never know what new textures or flavors you’ll be trying next! As someone who loves oysters and seafood, these were an amazing stray from the traditional raw variety. These chicharron oysters were a heaven-sent melding of ocean and earthy flavors, adding a crunch and almost BBQ flavor to the oysters. Even if you’re not an oyster fan you can appreciate these! If you can believe it, we actually still had room for entrees after all that (but not much)! Also, how cool are these plates? I am a duck fiend, so naturally I ordered the Hudson Valley Duck Breast, with giblet jus, apricots, snow peas and chickpeas. The waiter told me the usual duck order is medium-rare, but I chickened out and ordered it medium. It was still very juicy and flavorful, but a little on the tough side, which is totally my fault for not ordering it the correct way! This is a lesson to listen to your waiter people! In all seriousness, this plate was really delicious. The bright, citrus-y apricots were a great contrast to the duck, and who doesn’t love a good snow pea? The dish normally comes with a cornmeal pancake in place of the chickpeas, but they again were super accommodating to make the plate gluten-free without us even asking. Nick ordered the Grilled Whole Fish of the day (trout in our case), with sea lettuce relish, chickpeas, and swiss chard. He fully enjoyed his plate as well, obviously! We topped off this glorious feast with yet another inventive item – this Candy Cap Ice Cream! This dish had multiple levels of flavors, including sweet, tart, earthy and maple. I’m currently obsessed with it and need to go back asap for more! I can honestly say that since going gluten free, this is the most I’ve felt taken care of by a restaurant! Complimentary cornbread to start off a meal is the best a gal could ever hope for, and to constantly alter the menu and tell me ahead of time which items to order without gluten is going above and beyond. Also, do I even need to say more on the innovative menu options? It’s not your traditional dining spot – come here with an adventurous spirit and an empty belly, and you won’t regret it. From our friendly hostess and waiter, to the exciting menu, it will be truly hard to top Townsman’s level of service and innovative, super unique menu! Be sure to check out more Boston restaurant reviews, including my recent review of Gaslight in the South End, and my Boston ABC Dining project! Comment Challenge: What’s the most interesting menu item you’ve ever tried?